Happy New Year New York from Skyline PMR located in the financial district. In celebration of the New Year the doctors and staff at Skyline PMR would like to give you some guidelines to help begin the process of managing chronic pain. Not only do we wish you a Happy New Year, but we also want to start you off on a wellness plan for a better quality of life pain free. Chronic pain sufferers do not want to just check-out of life and suffer in silence. They want help! Our wellness pain management plan will help patients feel more energy, feel stronger, take control of their health thus allowing them to enjoy work and home life. This plan will also lower the desire for a quick fix — like medication. What would you like to improve and are you getting ready to get motivated! Physical fitness is vital to a healthy lifestyle. Moving your body by walking, exercising will not only tone your body but will also positively affect your heart, joints, mood, bones, lungs and brain benefit, too. According to the American Heart Association the best way to improve overall cardiovascular health, they suggest at least 150 minutes per week of moderate exercise or 75 minutes per week of vigorous exercise (or a combination of moderate and vigorous activity). Dr. Michael Monfett, one of New York top pain specialists weighs in on exercise and physical fitness. “Fitting in 30 minutes a day, each day will “The deliver amazing results, both mentally and physically in order to have a higher quality of life!” says Dr. Monfett. 3. A good healthy diet. Choose nutritious foods, with small portions, with healthy levels of high energy foods (carbohydrates, protein and fat) and nutrients (vitamins and minerals). Eating certain foods or ingredients have been proven to provide pain relief. For instance, simple carbohydrates promote it, while vegetables shut it down. Nutrition that supports a diet rich in anti-inflammatory foods is the key to anti-inflammation and chronic pain management. According to the 2005 Dietary Guidelines for Americans, you should consume between five and 13 servings of fruits and vegetables each day. This is equivalent to about 2 1/2 to 6 1/2 cups daily, depending on the amount of calories you need to consume for your weight and level of activity. Avoid dairy and grains: Eat dairy products in limited quantities. When choosing grains, stay away from simple carbohydrates with refined sugar. Opt for whole grains, including barley, buckwheat, oats, quinoa, brown rice, rye, spelt and wheat. Say no to red meat: Instead, include fish as the “meat” or eat vegetarian main dishes. Chicken is neutral — not harmful but not beneficial in the anti-inflammatory sense. When is it time to see a pain doctor? Stress can adversely affect an individuals health, mood, weight, sleep, causing pain, anxiety, irritability, anger, or restlessness. There are many recommended way to manage stress including meditation, yoga, gardening or taking walks. These simple tasks can help reduce stress. Mental health is just as important as physical health, and untreated issues — like anxiety or depression — can affect your ability to participate in healthy habits like regular exercise and restful sleep. All the suggestions in this article are just a foundation to a New Year, New Me, Pain Free beginning. Start making your health a priority by following a few of the suggestions presented. If you are feeling symptoms of chronic pain that is accompanied with weakness both physically and mentally it may be time to seek help from pain management professionals who can truly help you take control of your life for the better. You don’t have to struggle with feelings of fear, anger, substance abuse, extreme lows and highs, sadness, irritability, and chronic pain — seek help from a qualified pain specialist today! 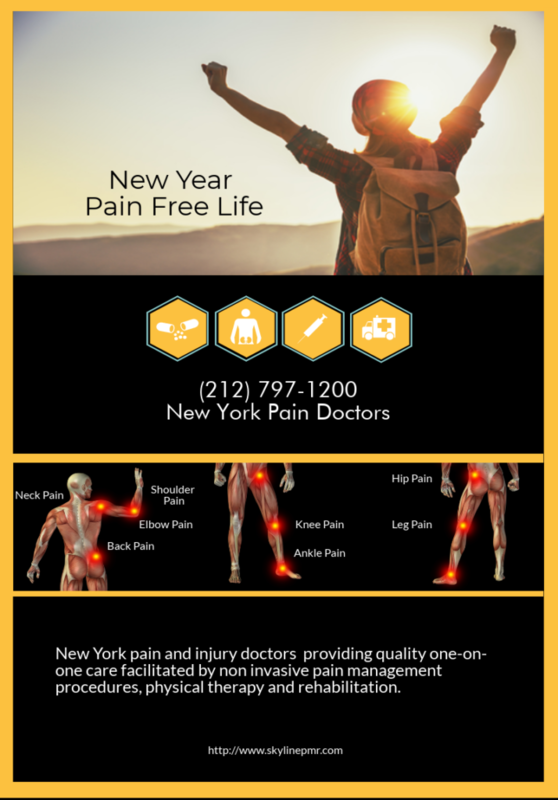 Skyline PMR located in the financial district can help you create your wellness pain management plan, call (212) 797-1200 to schedule an appointment with one of our pain specialists.